Vol. 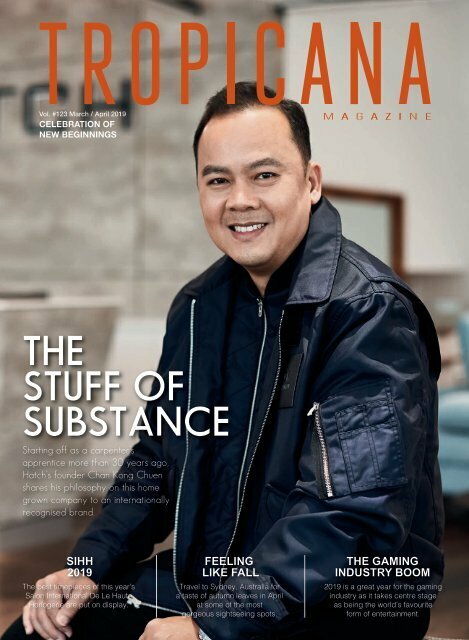 #123 March / April 2019 CELEBRATION OF NEW BEGINNINGS THE STUFF OF SUBSTANCE Starting off as a carpenter’s apprentice more than 30 years ago, Hatch’s founder Chan Kong Chuen shares his philosophy on this home grown company to an internationally recognised brand. SIHH 2019 The best timepieces of this year’s Salon International De Le Haute Horlogerie are put on display. FEELING LIKE FALL Travel to Sydney, Australia for a taste of autumn leaves in April at some of the most gorgeous sightseeing spots. THE GAMING INDUSTRY BOOM 2019 is a great year for the gaming industry as it takes centre stage as being the world’s favourite form of entertainment.